Don’t Forget: Register to Vote by Friday! Home » 2013 » October » 09 » Don’t Forget: Register to Vote by Friday! The deadline to register to vote in this year’s election is this Friday, October 11th in New York State. You don’t have to vote in November, but if you don’t register by Friday, you won’t have the choice! This means that if you are a first-time voter (or are changing your address) and haven’t already registered to vote in New York City or New York State, your registration form must be completed and delivered by this Friday. 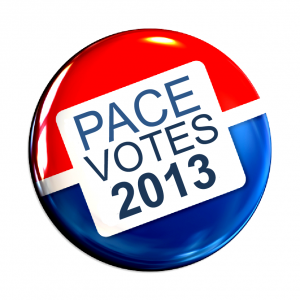 As a Pace student, you have the right to vote where you live. Whether that’s in a residence hall or an apartment near campus, you can vote at your parents’ address or where you are living now at school. New York City campus: Stop by Room Y31 in 1 Pace Plaza to pick up a voter registration form. If the office is closed, there will be blank forms for both NYC and New York State on the door. You can also stop by our table on Thursday, October 10th between 11:30am-1:30pm to register! We can answer your questions, let you register, and submit your form – no postage needed. Pleasantville campus: The CCAR office at 51W Choate House has voter registration forms for New York State – drop by and fill out a form! Outside of NYS: If you are planning to register at your parents’ address in a state other than New York, look up your local Board of Elections site to find your state’s deadline and voter registration form. Note: Forms must be filled out in blue or black ink pen – no online forms are accepted for voter registration! And don’t forget: Election Day is Tuesday, November 5th!